NBC's Dateline program aired pro-drone propaganda this week and has posted the video online. Their so-called report purports to be "balanced" and "even-handed." In fact it misleadingly promotes an extremely destructive government program that millions of people would protest if they knew the actual facts of the matter. Dateline introduces us to drones with the claim that drones have saved lives by "hitting terrorist targets." 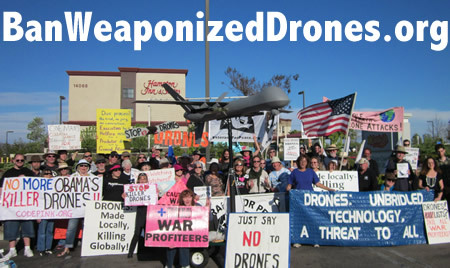 Unlike any negative statement about drones made in the course of this Dateline video, such positive statements are never immediately countered by somebody authoritative saying the opposite in a different vocabulary (such as "murdering human beings never convicted or even indicted for any crime" rather than "hitting terrorist targets"). Much less is any positive statement countered with actual facts. At the very end of the program we'll hear that during this "war on terrorism" terrorism has increased, but the causal connection recognized by numerous experts is brushed over. In fact numerous top officials involved in the U.S. drone program blurt out, the moment they retire, that it is generating more enemies than it is killing. Numerous such statements are publicly available, and such voices could have been included in this program. Next Dateline shows us a drone pilot in Nevada in his car and "on his way to fight ISIS." In fact, U.S. drone pilots (who dress up as pilots and sit at a desk) blow people up in numerous countries, have (like their commanders) no idea who most of the people are whom they blow up, and have seen ISIS recruitment soar since the U.S. began bombing that organization which its earlier bombings and occupations and prison camps and torture and weapons sales were absolutely central to creating. Dateline shows us footage of drones, but none of what they do -- only fuzzy videos selected by the Air Force in which we see no humans, no bodies, no body parts, and are just told that the people murdered were ISIS, which is supposed to make it moral and legal. Endless footage exists and is available, including of course from the Air Force, of the people blown to pieces by drones. Plenty of reporting explains that this type of warfare kills more innocent people than even other horrific types of warfare. But Dateline will instead eventually get around to focusing on phony critiques like "Is this too much like playing a video game?" Dateline lets us meet "pilots" and hear their views. We meet no victims, no survivors (available footage includes testimony before Congress), and no targets. A man recently traveled to London from Pakistan to request to be taken off the kill list and for the United States and Britain to stop trying to blow him up. He was not arrested, by the way, which CIA Director John Brennan falsely claims later in the program is always preferred. Drone pilots and the narrator (should we call him a "reporter"?) tell us on Dateline that they protect human lives, rather than destroying them: "Operators often keep watch over U.S. troops on the battlefield." Dateline glorifies the technology describing "an exotic array of onboard bombs and missiles." Dateline shows us drone footage of their "journalist" that is fuzzy but that he tells us is clear. Yet that's the closest we come to seeing footage of an actual drone victim. Government documents that reveal that most victims have never been identified or targeted, and which contradict much of what government officials say on this program, are public. "Do you ever feel guilty that you're fighting an enemy who can't hit you back?" Dateline asks a drone pilot, reinforcing the idea that he's fighting an enemy, and not asking if he feels guilty for killing human beings, for killing non-enemy human beings, for generating more enemies, or for violating the laws against murder and against war. "We're saving our troops on the ground," the drone pilot says, without explaining how or, of couse, why those troops are on that ground and couldn't be saved by leaving it. "Drones are decisive weapons, key to U.S. military dominance," Dateline tells us. Then we see Brennan claiming drone murder protects the United States. Then we see fuzzy distant footage of an unarmed drone's film supposedly showing Osama bin Laden prior to 9-11. The implication is that blowing him up would have prevented 9-11 and its thousands of deaths, if not perhaps the millions of deaths caused by the U.S. wars marketed as responses to 9-11, since those wars might have been given a different marketing theme. But the cartoonish implication that a single evil mastermind was the source of all resentment and violence toward the United States, and that murdering him wouldn't have further enraged many others, is torn down by Dateline itself which later claims triumphantly that drones have murdered seven potential replacements of bin Laden. The CIA's role in the Dateline film is more extensive than in the production of Zero Damn Truth -- er, I mean, Zero Dark Thirty -- and we next hear Brennan claiming that "Counter-terrorism professionals always would prefer to capture individuals." That counter terrorism is terrorism, that children living under the constant buzz and threat of drones are traumatized, never comes up. And Brennan's claim is false. We know of numerous cases when someone could have been easily arrested, but murdering them and anybody nearby was preferred -- or at least murdering whoever had that person's cell phone at the time. Brennan's next utterance is ludicrous: "Taking kinetic action against a target or individual usually is a last resort." Because the option of not doing so doesn't exist? This flood of propaganda is not impeded by the voices of critics, protesters, lawyers, survivors, or victims, by the views of foreign governments or the European Union or the Pakistani courts, by the perspective of families afraid to step out of doors. The "successful" drone war in Yemen that predictably led to a larger war is not examined. The spread of terrorist groups, the strengthening of al Qaeda in places like Yemen goes unmentioned. Instead, Brennan blatantly lies that al Qaeda has been "very methodically dismantled." No voice replies to that provable falsehood. In fact, Brennan tries to fudge his words to leave a way out, but the message received by the viewer is false. Dateline's "reporter" who is to a reporter more or less what a drone pilot is to a pilot holds up what he says is a list of "285 names of terrorist targets" and exclaims that "about half are gone" -- clearly expecting us to shout Hurray! Then -- blink and you'll miss it -- we hear from critics of drone killing, specifically three former participants therein. But it's the Dateline reporter who claims this: "It's because drones are so effective that we use them more than we should, critics say." Effective at what? 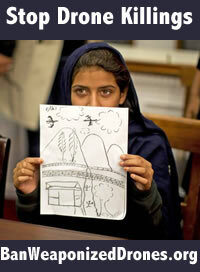 The critics he then turns to say drones are counterproductive and immoral, but they don't say that on Dateline. The seconds they are given do not allow them to say on NBC what they've said elsewhere. The former pilots and participants do raise the topic of killing civilians, and the "reporter" asks whether they didn't realize the military kills people. He also asks them if drone warfare is "video game warfare" and then takes that line of his to the commander of Creech Air Force base and asks him the same silly question. He also lets that commander claim that "every effort is made" to avoid killing civilians, before devoting one sentence to what "international human rights organizations say," without putting them on the air to say anything. But our "journalist" counters that with what Obama says -- allowing Obama to say it directly -- and then brings on a pseudo-critic to wisely tell us that the truth must lie somewhere in the middle. Isn't it more likely that the truth lies somewhere near the serious journalism that identifies the victims? Dateline brushes aside the question of who's being murdered and never touches the question of legality, focusing instead on the supposed need for "transparency" from the White House. Dateline briefly mentions signature strikes and double taps, and even has Brennan acknowledge that the number of terrorists has grown (without commenting on why). The best question Dateline asks is when it asks the base commander what the U.S. will do if other nations do drone murders (perhaps in the United States). But the reply is not met with laughter or critique: "We'll adapt. We don't rest on our laurels." Adapt how? Wasn't that the question.